I took a dozen or more pictures of her snow dance that day but she was so far away that she was very tiny. Experimenting with my scanner, I found I could bring up her up better in detail. Here's one of those details. Experimenting in Photoshop, I also added watercolor filter. It makes the snow look wetter than it was, but I liked what I got, so that's what you're getting. 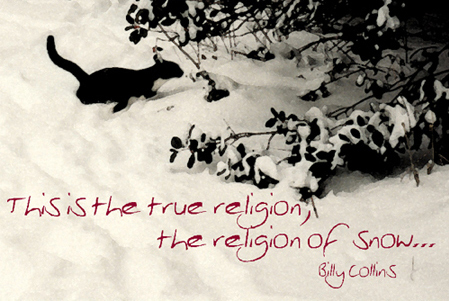 The quote is from Billy Collin's "Shoveling Snow With Buddha," from Picnic, Lightning. The font is Reactivare, by Peter Stanton, formerly of Blackboard Etiquette.